Guppy Fish Care - How to Care for Guppies? Guppy fish is probably the most common live bearer tropical fish in the aquarium hobby. It is also known as rainbowfish, thanks to its wide range of colors and patterns. They are also known as millionfish, because if they can reproduce very fast and can populate whole ponds in a very short time. The guppy fish has become so popular because it is a beautiful and colorful fish and it is a relative hardy fish, perfect for beginners. In this article I will show you my best tips on how to take care of your guppies and what to do to keep them healthy and long living. Compared to other tropical fish, to discuss for instance, guppies are very small. Depending on conditions and genetics, female guppies can grow up to 1.5 inches, while male guppies to 1.2 inches. They reach full-size maturity in about six months. They do not produce much bio-load, so they do not need much space to live. However to keep them healthy you need offer them a minimum amount of space. In the aquarium hobby there is a very common method of calculating how many fish you can keep in an aquarium: 1 inch fish / 1 gallon of water. If you follow the above rule, in a 5 gallon aquarium you can keep up to 3-4 guppies. You can increase the number of fish you put in your aquarium if you add filtration and live plants. Filtration and live plants will help eliminate the toxic fish waste from the water column, this way you can keep more fish without the need of changing the water very often. Having filtration and plants in your guppy tank will not save you from changing the water. You still need to do your weekly water changes, to keep the fish healthy, but you can keep a bigger stock of fish in the same amount of water. For keeping guppies, I recommend at least a 10 gallon aquarium, in which you can add 7-10 guppies. Now that you know how many guppies you can put into your aquarium, you need to choose the male to female ration. This is very important, because male guppies chase female guppies all the time to reproduce. 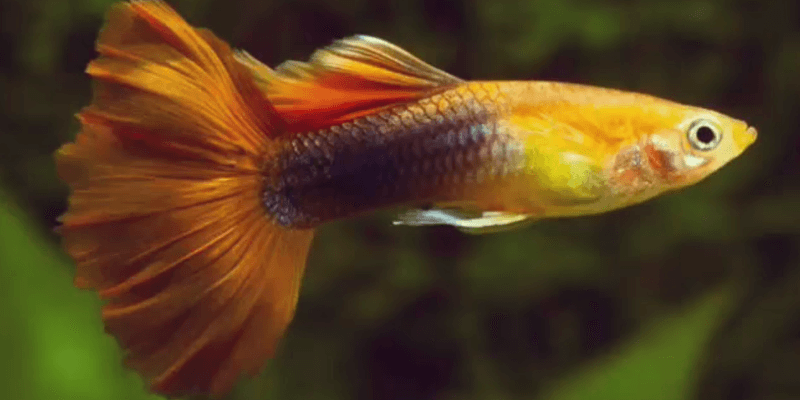 Female guppies can be exhausted in this process. So it is wise to choose a 1 to 3 ratio, one male to three females. This will give the females enough time to rest and recover. You can also setup a males-only or females-only guppy tank. This way you will avoid all the harassment of the females and overpopulation of your aquarium. Guppies that are not reproducing can live a longer life. Guppies prefer harder water. Usually the water hardness increases with the pH level. In most areas the tap water has a pH of 7.6, which is perfect for keeping guppies. However be careful when using tap water for your fish. Tap water usually contains chlorine and chloramine, which is low quantities, is not harmful for human use, but can cause significant damage in your fish, or even death. Changing water in your aquarium is very important. Fish produce waste, which is toxic for them. Changing the water is the only way to remove waste and detoxify the water column. Use a water conditioner for your tap water that will remove heavy metals and chlorine; or let your tap water sit in an open container for 24 hours to evaporate chlorine. I use Seachem Prime to condition my water. This product instantly eliminates the heavy metals and chlorine from your tap water and it is safe to use right away. If your aquarium if over-stocked (you have too many fish), you should perform bigger water changes more often. Feeding fish is always fun, especially guppies. When I approach my aquarium, all my guppy fish are gathering to the surface, waiting for food. Guppies accept a high variety of food. You can give them vegie flakes, spirulina tabs, frozen food, live food, even raw vegetables. When you are feeding your guppies, make sure you offer them a variety of food in order to keep them healthy and colorful. Feeding them once a day is enough. You can also feed them multiple times, but avoid giving them too much food. The most important thing when feeding your guppies is to not overfeed them. Offer them only the amount of food they can eat in about one minute. Overfeeding is the most common problem of fish death. Feeding your fish too much food, will result into ammonia spike, which is highly toxic for your fish. Fish waste and uneaten food will convert into ammonia. In normal situation, ammonia (NH3) will be converted into nitrites (NO2) right away by the beneficial bacteria in your aquarium. The nitrites will be converted into nitrates (NO3), which is less toxic for your fish. This is called the nitrogen cycle in aquarium. The nitrates will be removed from the water column by your live plants and partial water changes. In case of overfeeding, so much ammonia will be produced by your fish and excess food that the beneficial bacteria won’t be able to convert it fast enough into less toxic nitrates. High ammonia level in your aquarium can kill your fish in just few hours. The worst thing is that it has no prior signs. So be very careful with feeding your guppies. I get this question very often: Do I need a filter for my guppy tank? Well, yes and no. You can run your aquarium without a filter. The key to this is to do bigger (50%) weekly water changes and have good control over your feeding. And also keep your number of fish to minimum. I also recommend adding live plants to your tank, if you don’t want to use a filter. Plants can keep your water clean, and remove the nitrates from the water column. Please also remember, that an air pump is not a filter. It is not enough to drop an air stone into your aquarium. It won’t replace your filtration. If you have an air pump, you can hook it up to a sponge filter, which will do a very good job removing the ammonia. A very basic sponge filter will be good. However if you can afford, buy an internal filter. I use the Aquaeon Queitflow for my 10 gallon aquarium. If you don’t want to use a filter at all, I recommend using a very thick substrate (4-6 inches). Using a thick substrate in your aquarium, you will create an anoxic zone, where the beneficial bacteria will transform nitrates into nitrogen and oxygen gas, which are not harmful to your fish. These gases will build up in your substrate in form of bubbles, and they will be released into the air time-to-time. If you see small or bigger bubbles floating up from your substrate, you should know that the bacteria are doing the work. I’ve tried out the thick substrate method in an aquarium, and works very well. I use the Seachem Flourite Dark, which is a substrate for planted aquariums. Another question that I often get is: Do I need a heater for my guppies? Yes, you need a heater, unless you live in a tropical climate. Guppies are tropical fish. They are originating from the Amazon River, where the annual maximum temperature is 90 °F (32 °C), and the minimum is 73 °F (23 °C) (source) . If you keep your fish in your home, most likely your room temperature will be at minimum of 70 °F in the winter. This temperature can be tolerated by your guppy fish; however you are exposing them to diseases. I highly recommend getting a heater, because your fish will suffer from low water temperature. I use the Eheim Jager 50w aquarium heater, which can keep the water temperature stable at 74 °F (23 °C) in my 10 gallon guppy aquarium. Do guppies need artificial light? No, but they need some sort of light. For guppies the light coming through your windows is enough to stay healthy, so they do not require additional lightning. However if you are keeping live plants in your guppy aquarium, artificial light is vital. Most aquarium plants need bright and strong light for at least 8 hours a day to photosynthesize and grow. If your aquarium is near a window seal, and it is getting strong sunlight, you might get away keeping plants healthy. Having an aquarium in your room is a very good way to introduce a piece of nature into your life. Guppies are very active fish and fun to watch. They are also easy to keep fish, if you know what they need. Choose a good size aquarium and place some guppies in it. Feed them a variety of food, but never give them too much. Do your weekly water changes to keep them healthy. They will reward you with their beauty and lots of fry. Next post Guppy Fry Care – How to Care for Baby Guppies? How can I send you a photo of my sick guppy? You can find the contact page at the bottom of this page. You can attach and send a photo via the contact form.